Almost to one billion views! Check it outtt. 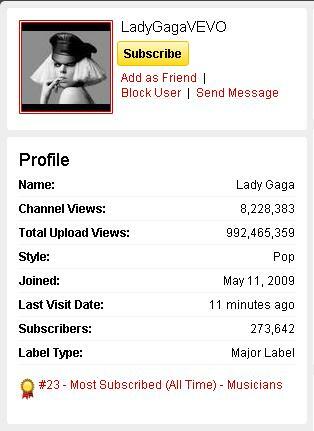 Lady Gaga’s VEVO Channel is almost to ONE BILLION VIEWS. As of approximately 9:00 tonight, Lady Gaga’s videos have been viewed 992,465,359 times. People are memorizing her lyrics, melodies and dance steps and sing them back to her during her concerts productions. That has got to be one of the best feelings in the world. Tags: Billion, Lady Gaga, Music, Vevo, YouTube. Bookmark the permalink.